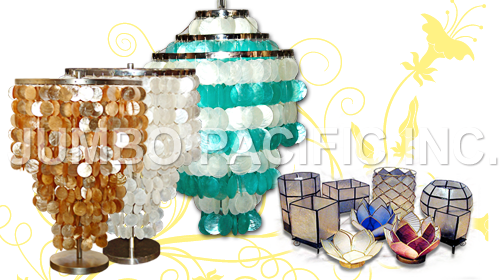 Philippines Natural Shells MOP Capiz components for chandeliers candle holders lamp shades shell tiles shell panels. Capiz is made form the finest natural material called capiz shells. Capiz shells are widely use for interior decoration. The natural effect of capiz shells to interior designing creates a good ambiance to your home or office. It is processed, cleaned, polished and perfectly cut to make a beautiful material to make wind chimes, tiles, capiz chips, lamp shade, hanging lampshade, capiz curtains. Capiz are also used for interior decorations such as capiz wall coverings, capiz interior decorating, capiz tiles, capiz natural surfacing, capiz shell natural covering, capiz shell netural stone surfacing, surfacing materials capiz and capiz shell wall paper for hotels, offices, buildings and even for your home. Capiz shells are also used to make fashion jewelry and fashion accessories. The Capiz shell components are one of the materials that are used to make body jewelry such as necklaces, bracelets and earrings. 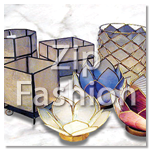 Capiz shell products comes from a variety of of designs, shapes and sizes depending on customer's choice and preference. 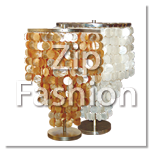 These lamps are available in any size, as well as any number of strands and capiz chips. It's chips can be cut according to your preferred size and shape and are availble in different colors and designs. Jumbo Pacific's candle holders are made from natural capiz shells framed with painted brass. Capiz shells are carefully cut into petal-shaped chips to form various flower design candle holders. Colorized with striking and gradient color combinations, these candle holders will be great for touch ups and adding vibrant shades into any room. One of the most beautifully-designed lamps these days. Circular-cut capiz shells in their natural color are knotted together to create these lengthy capiz chandelier wind chimes. 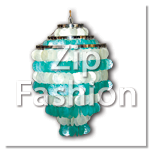 The strings that are attached to to make a beautiful chandelier lamp is called capiz shell strings. It's height is perfect for front doors, long and narrow windows or for adding more depths in any room. The lamp's dimmer allows you to set the light's brilliance according to your mood.